This will be a short account of what the PC party get up to. It is simply to keep players up to date (especially those that miss sessions). It is no great literary work - I am going for dot points. (If a player wants to write an 'in-character account' of their adventures I would be stoked). Reminder: Campaign begins in the 6th month (and 1st month of Summer): Dehaluyi (Moon of the Green Corn), 718 N.F (Nerath Founding). Ravenday, the 8th of Dehaluyi (Green Moon, Summer 1), 718 N.F. *5th day of travel with the House Verdana (from New Turath) caravan. Leave Elsircross in the morning and heading to Red Rock. *Scouted a goblin ambush before it occurred and ambushed them in turn. 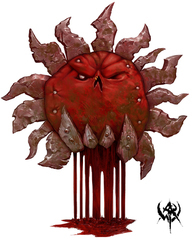 (Tribe of the Bloody Sun - larger, gangly goblins with rust-coloured skin, large ears and noses. With smaller yellow-skinned goblins as slaves or servants). *Some PCs (with Ubada & Beasley) find goblin camp. Kill all there and loot the place. *Whilst some scouted for the goblin camp others back with the caravan were attacked by stirges whilst serving lunch. (Elizari almost killed). *Continued on to Red Rock. Met with Sheriff/Guard Captain Reginald Merton and female representative of House Pendal (Kira) who showed them to a warehouse they could hire whilst staying in Red Rock. 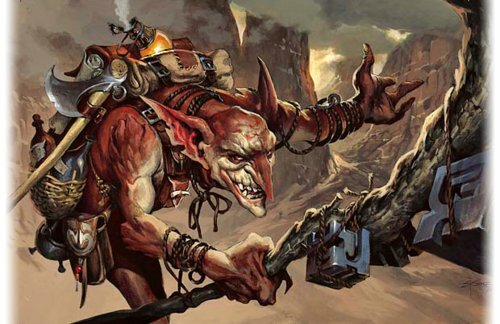 After initially stating in public, 'that the locals want no trouble with the goblins', the sheriff later came to the PCs asking them to scout out whether it is true that the goblins are mustering for an attack, and whether their totem has been stolen. After bungled negotiations PCs decided to take a look. *On their way out of town, near the covered red bridge, PCs were hassled by a mob of miners led by non-other than Goran Ving, Town Councilor and member of the Red Rock Mining Guild. *Traveled through foothills of the Giantshield Mountains in a eastern direction and camped the night. Bearday, the 9th of Dehaluyi (Green Moon, Summer 1), 718 N.F. *Continued journey east and at a rapid river crossing spotted an eagle-headed tribal humanoid staring at them from the trees. After speaking with the being the PCs found it was Kwahu, an old, blind Shentulka witchdoctor with an eagle mask, that has lived in these parts for some time. He too was concerned with the recent activity of the Bloody Sun goblins and agreed to show the PCs back to his camp and then to the goblin tribe in the morning. *On way to Kwahu's wigwam two bladelings attacked from the trees. They had been sent by the goblins to eliminate Kwahu. Obviously there were divisions in the goblin camp, as most revered the spirits, but these bladelings were special beings gifted to worshippers of Bane. Drakeday, the 10th of Dehaluyi (Green Moon, Summer 1), 718 N.F. 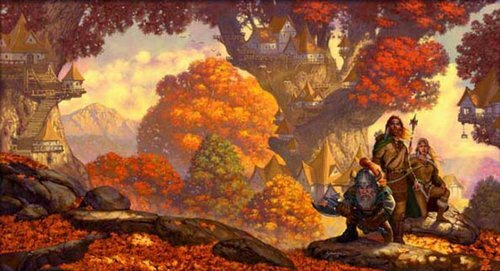 *Scouting ahead to where a few goblin shouts could be heard, Fang & Faral came upon three Bloody Sun goblins looking down at bushes and cheering. Fang shot the goblin with a feathered headress and they all turned on him. Even at a distance, two goblin dogs ran Fang down as he and Faral attempted to run back to the rest of the party. *Fang was taken down and mauled to death; Faral made it out of the trees. As she crossed the boulder-strewn open area heading towards where the other PCs were (in the next copse of pines), the PCs came to her aid. The two goblin archers and one goblin dog that pursued were dealt with and the one with the headress was captured and agreed to take them to the tribal meeting. He claimed they had better hurry for all the clans were there now deciding on whether to march on Red Rock. *As PCs entered open area of goblin camp, they saw a circle of several hundred. Three wild goblins charged from the throng, whilst the rest watched in amusement. *The PCs defeated the goblins (who were part of a seperatist faction, led by the blue-tinged sub-chief Ralak). When the PCs followed this up with strong negotiations with Chief Girtit Nookl. Ralak and his supporters left in disgust. They were leading the push to attack Red Rock, and had been winning until the PCs showed up. With the help of the heroes Chief Nookl convinced the Bloody Sun to hold off an invasion if the PCs went to find out about the whereabouts of their missing 'Sun Stone'. Giving them 8 days to return to the goblins to state whether they have found it. (The goblins are certain the humans have it, though it was one of Ralak's goblins that claimed to have seen the fleeing humans heading towards Red Rock). *Negotiations complete, returned to Kwahu's camp. Ate, rested and performed some rituals (including one, where Kwahu rubbed different types of berries into each of the other PC's hair, so he could identify them by scent). Thunder Lizarday, the 11th of Dehaluyi (Green Moon, Summer 1), 718 N.F. *Long journey back to Red Rock. On one of the mining trails nearing town, a grubby teenager with an overweight bulldog ran towards the PCs highly distressed. Apparently his father was trapped in a mine. *As PCs approached they were shot by a crossbow from the dark mine entrance and from an arrow out of the back of a wagon. In the ambush another 'rough' jumped out of the wagon and attacked with a lump of metal. When Kwahu set the wagon on fire, the archer also abandoned it. The teenager, dog and archer were killed during the fight. The mace-wielding guy surrendered and the crossbowman escaped by fleeing into the mines. *Although the PCs had heard Ving's name mentioned during the fight they asked for confirmation and the man produced a letter that stated that he and his fellow men were to make sure "those weird-looking troublemakers did not make it back from the bandit camp". Although it was not signed by anyone, the captive confirmed Ving gave the orders. He was then released and fled into the wooded hills south. *PCs took the payment in gold from the wagon and returned to Red Rock. In town Sherrif Reginald went to convene the Town Council after speaking with the PCs. They returned to their warehouse/camp. On the way they spotted a strange elemental humanoid at the dwarven smithy. Rocc popped in for a drink with the dwarves. *Soon the PCs were summoned to a Town Council meeting at Mayor Bonwit's residence. During the meeting it was clear the council was not a cohesive unit. When it was suggested the PCs investigate whether the goblins' 'Spirit Stone' was in fact taken by residents of Red Rock, Goran Ving seemed only too-pleased to back the idea. As each council member left one by one, the PCs were left with a drunken Bonwit who confided in the PCs how much he hated his position in this backwater mining town. His family business is based in Brindol and clearly the half-elf wished he was there. Hawkday, the 12th of Dehaluyi (Green Moon, Summer 1), 718 N.F. *Not sure where to start, the PCs contemplated going straight to Boss Ving's residence. After a few hushed questions around the place, things were going nowhere, when the PCs encountered some young hoodlums in the town square causing trouble. After sending them on their way, they later saw them in the company of Ving. *Ving had come looking for the heroes after receiving a threatening message (sent via canary under a magic ritual). In another verbal confrontation (this time near a lot of miner's residences) the PCs made it clear that they were after Ving and he responded in kind. A fight was avoided, thanks in part to the nearby Copper Dragon patrol (name given to the town guards). *The PCs instead focused on the band of youths that made their way to the ruined warehouse near the bridge. Once there they trapped and intimidated the leader who revealed he and the others had to deliver food and messages to some out-of-town roughs along the cliff-face, through the trees. *Following this lead - PCs snuck up on the residence. When discovered a fight broke out. Four roughs were defeated (including their leader weilding a lightning spear, who was fried in flames). One captive told the PCs that Ving's 'treasure' was 'in the mountain'. There were guards in there and access was gained by reading a teleportation ritual. The PCs were handed a copy of this ritual, Kwahu claimed the magic lightning spear. *Returned to town (as Beasley was growing wary of his sister's safety after Ving had sought out the PCs). Rocc spoke with Kulkin again and Kulkin asked Beasley if he was seeking more workers. The newly arrived man with lame for hair was apparently descended from great adventurers and wished to adventure himself. That is how Sardis joined the group. *When the PCs met with Artemis, she told them that she too had a new employee for the caravan. Ander, known more commonly as 'Smiley' was a fellow halfling that had to leave Dennovar in a hurry and Artemis took him in. *Along with the two new employees the party undertook the teleportation ritual and found themselves in a pitch dark cavern with a wall at their backs, a fading blue circle and two pairs of leering, glowing red eyes in the darkness. The eyes belonged to two iron defenders and they were accompanied by a flying clay homunculi and an iron snake. The automatons were destroyed and each of the 'hounds' had a collar with Vings hammer and pick seal and a key each. *One key got them through the large iron door out of the cavern. Followed an old mine shaft some distance. Around bend, a door was slightly ajar and gambling could be heard from within. *Rocc burst in to find a group of guards surprised to see the PCs. Some thought they may have been their replacements. But rather than get a rest back on the surface most were sent to the afterlife, despite Kwahu trying to keep them alive. The Shentulka of the group was kept alive and agreed to join the PCs if they could get him out of the mine. (Apparently the PCs were supposed to bring a 'key' to enable the teleportation ritual t be complete and allow these guards to return t the surface). *Kuatan, the captured Shentulka, showed the PCs where Ving hides a control panel that disarms the traps of the 'Passage of Death' that leads to the 'treasure'. Kuatan claimed to have never seen the treasure, but could feel its presence. Smiley disarmed the traps for the passage and the PCs entered tentatively. Another metal hound was dispatched and then, behind a door at the far end of the 'Passage of Not-So-Bad-At-All' was the Spirit Stone sitting on a shelf. Also found another teleportation scroll with the 'key' - a tiny silver hammer. *The teleportation took the PCs to the entrance of another old mine. Outside a small camp of hill billies sat around a fire. Faral scouted the group in hound form and the PCs decided to sneak away. 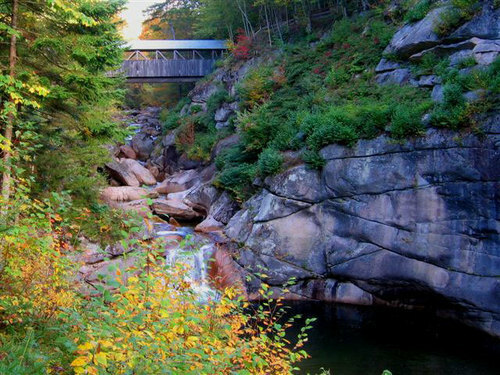 The gulch led down to the valley of the river that flows back to Red Rock. *Instead of heading back to town, the PCs decided to take the 'stone' straight back to the Bloody Sun goblins. They pushed hard into the night and camped high up in the hills. Serpentday, the 13th of Dehaluyi (Green Moon, Summer 1), 718 N.F. *In the highlands the party came across a high meadow and Faral gathered some helpful herbs. On their way towards the goblin camp a small campsite was also found. It was fresh. *When they arrived at the goblin camp the whole tribe was again gathered in a circle at the center of the camp. Another argument was taking place, but this time it was Goran Ving and his bodyguard inciting the tribe to attack Red Rock. The PCs interrupted proceedings and a large fight broke out. As Kwahu revealed the Spirit Stone and took it to its resting place more goblins rejoined the side of Chief Nookl (whom the PCs supported). Ralak (the blue-tinged goblin) and Ving's bodyguard fell along with many of their supporting goblins. The rest abandoned hope at this point as the PCs circled in on Ving and his hammer. He took a bad blow to his arm and was ever-weakening under a swarm of attacks. On his last legs, Kwahu surprisingly moved into melee to finish Ving with his spear. 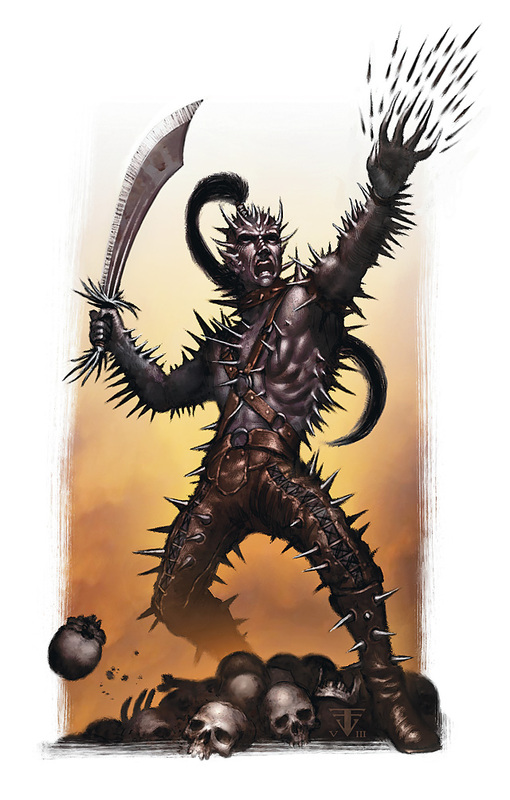 The attack didn't finish the formidable Ving, but as he raised his hammer to kill the blind witch-doctor, the half-beast-looking Rocc struck his shortsword home under the Mine Boss and Betrayer of Red Rock's ribs. Finally he fell and the goblin camp erupted into cheers and music..(well drum beats and high-pitched screams). *Heroes were honored with a goblin feast and dancing. Their faces were painted in sacred red paint and each was given a lump of amber. During the ceremonies a female goblin also slipped a silk, purple-blue cape over Smiley's shoulders. Party into the night. Bisonday, the 14th of Dehaluyi (Green Moon, Summer 1), 718 N.F. *Left goblin camp. Stopped at Kwahu's camp and he packed it up. *Pushed towards Red Rock - camped near a prominent rock outcropping. Stalkingcatday, the 15th of Dehaluyi (Green Moon, Summer 1), 718 N.F. *About one hour into trip dwarven bandits attacked, initiated with a swooping pet blood hawk. One dwarf peppered the group from a rocky perch, whilst others slid/fell down side gutters on the slope to attack. The hawk fell quickly, as did the dwarves that came down to fight (and didn't make it to melee due to Kwahu's poison). Smiley climbed up to attack another dwarf and the crossbow-shooting dwarf climbed up and over the ridge to escape. *Reached Red Rock as just after midday. Kept a low profile (Artemis had already packed up her stall, stating there had been a little trouble around town). Heroes kept a low profile in the warehouse. A couple visited the mayor to tell him the true story behind the Spirit Stone and of Ving's demise. The Mayor arranged for their reward (lots of copper) to be delivered to the warehouse. Elyas visited the temple of Moradin to retrieve his ritual book and they had added a few for him. They also had a present from Azgali's family (a silver chain with a lock on it that glowed blue when peering into its keyhole). Ravenday, the 16th of Dehaluyi (Green Moon, Summer 1), 718 N.F. *Following a pre-dawn downpour the caravan left Red Rock, happy to leave behind any repercussions following Vingh's demise, heading down through the foothills to the edge of the woods. Arrived in the elven-influenced village of Witchcross early evening. 17th & 18th of Dehaluyi (Green Moon, Summer 1), 718 N.F. *Stayed in Witchcross. Artemis traded, Smiley gambled, Faral acquired a ritual book and Elyas mastered some of his new rituals. *Smiley heard about trouble on the roads south whilst gambling. Apparently goblins mounted on giant bats were killing travelers. Thunder Lizarday, the 19th of Dehaluyi (Green Moon, Summer 1), 718 N.F. *Left Witchcross, taking the south road along the edge of the Witchwood. About half way to Talar the group were attacked by none other than goblins riding on the back of bats! Artemis was kidnapped and taken by the goblins. (See cartoon). *There was something odd about the grey goblins of the Gnawstubble tribe - their dogs sprouted long tentacles from their backs and the bats they rode had long scythe-like tails. *The party made a mess of the rest of the attack and when it was over they decided to go after Artemis. Smiley stayed with the van whilst Beasley and the heroes went into the tangled mass of the Witchwood on the trail of the kidnappers. *After an hour tracking through the woods the group came to a sinkhole with ropes dangling over the edge. Kwahu, being afraid of climbing, decided to stay at the top and wait for the others, who proceeded to climb down the ropes to a platform about 30ft down. (View from the ledge of the sinkhole). *Faral was the first down and she followed a goblin towards a cave, the others followed quickly behind. The hasty Faral, who was joined by Beasley, came upon a cavern which was full of goblins (most of whom had odd or deformed characteristics) and bats; a battle began as the two waited for the others to join them. A female goblin with excessively large, white eyes appeared above them on a rise and summoned wicked goblin spirits which took to the adventurers. The others arrived and the battle waged evenly across the cavern until a rather vicious bat swarm engulfed Faral and took her out of the fight. She was on the brink of death when Beasley made a dash for her and administered first aid, saving her life. 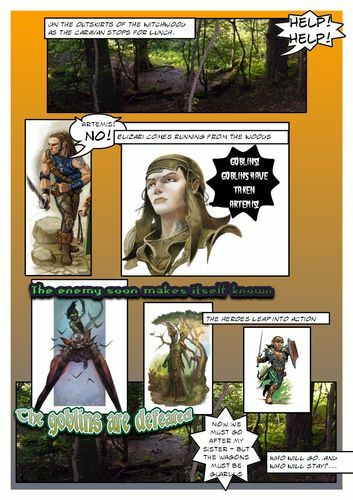 Shortly after, Sardis was taken down also; the battle was in the balance, but the group managed to take out the female goblin, then the tide turned and the goblins were quickly overwhelmed. *After a short rest the group continued down the tunnels and came to a cross junction. 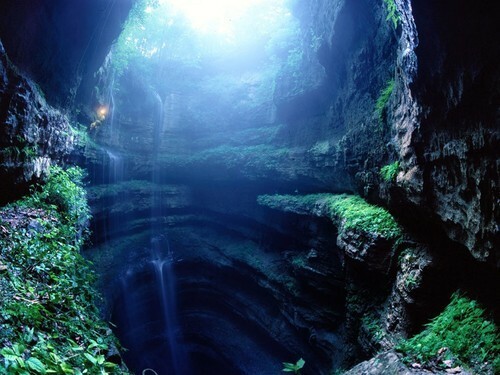 Seeking the guidance of the spirits, Faral advised the group to take the tunnel on the right, they did, and shortly after came upon Artemis chained in a room with goblins. The goblins were carrying bits and pieces of their victims, it appeared to be a goblin kitchen, and fresh meat was on the menu. The room was splattered with gore and a large pile of refuse lay in an alcove. *The group raced into the room, Beasley led the assault; the tough little halfling cut down a goblin before it realised what was happening. Rocc followed shortly after delivering a massive blow with the warhammer of master Vingh (now shrunk to fit the gnome's hands). The blow was devastating, rendering a goblin cook's arm useless and spreading fine lines of dark energy from the impact site. A fierce fight ensued, during which, in the middle of it, the garbage and filth rose as one amorphous ooze and began attacking anything that moved. For a short time the party looked like they were in dire straights, but the group once again proved that they were destined for greater things and overcame the creature and the goblins. Beasley and Artemis were reunited. *Returned to caravan to find Lady Celiira Nesten and four of her companions were also in the area to kill goblins. The heroes soon learned Lady Celiira was the recently appointed ruler of the town they were on their way to - Talar. Everyone went to Talar and Lady Celiira had the caravan stay with her at her manor. Hawkday, the 20th of Dehaluyi (Green Moon, Summer 1), 718 N.F. Talar was a strong Shentulkan town, Kwahu sought information on his ancestral medicine stick "Natchez" and heard rumours that it had passed on into the west. *Smiley took on Morrocco in a game of chance and won a riding dog for himself, naming it Sunny. *Elyas purchased a ritual which he sought the help of Kwahu to cast, using it to disenchant the tainted staff he had acquired. *Sardis purchased a pet wolf. Serpentday, the 21st of Dehaluyi (Green Moon, Summer 1), 718 N.F. *Spent the day & night in Talar. Bisonday, the 22nd of Dehaluyi (Green Moon, Summer 1), 718 N.F. *Left Talar. Travelled west along the Dawn way to Nimon Gap; arrived mid-arvo. *Spent the night in the small hamlet. Stalking Catday, the 23rd of Dehaluyi (Green Moon, Summer 1), 718 N.F. *Spent the day & night in Nimon Gap. Ravenday, the 24th of Dehaluyi (Green Moon, Summer 1), 718 N.F. *Left Nimon Gap. Travelled to Terrelton; arrived mid arvo. Bearday, the 25th of Dehaluyi (Green Moon, Summer 1), 718 N.F. *Spent the day & night in Terrelton. Drakeday, the 26th of Dehaluyi (Green Moon, Summer 1), 718 N.F. Thunder Lizarday, the 27th of Dehaluyi (Green Moon, Summer 1), 718 N.F. The group left Terrelton in the morning and made the journey towards Drellin's Ferry. Around mid afternoon they approached an old derelict farmhouse on the right hand side of the road, some of the group had an uneasy feeling about the farmhouse. *An ambush was sprung upon the heroes by a small cluster of Hobgoblins claiming to be of the 'Red hand?" The party was trapped on the road with the wagons. *As the battle began to unfold, Beasley ran to one of the wagons and unfurled a standard, he struck it deep into the earth and a sense of strength and vitality washed over the group. *Elizari ran to the apparatus, which up until that particular point in time had not seen any use, she moved into the mechanism and began to manipulate it to attack. *soon the party was surrounded, and the attackers were joined by fiery red hounds and two large hobgoblin leaders, one, who was named Zor, claimed to be a devout servant of Tiamat. *The battle was furious and a number of hobgoblins perished quickly before they finally got the better of Ubata, who was slain. *Soon the battle became one sided and one by one the hobgoblin attackers, including the two fiery hounds, fled, however Zor refused to flee, standing defiant he eagerly awaited his journey to the dark queen as he was surrounded by the party, but it was Xerzed who delivered the death blow, smashing the fearless leaders' mind to pieces and bringing an end to a rather bloody battle. *Artemis and Beasley went over to their fallen comrade and Elyas constructed a burial shrine over the top of Ubata's body, whilst Smiley and Rocc went over to the house and began an intensive search. *They were joined shortly by the rest of the group, many things were found of interest, amongst them was a box of half starved tiny drakes, which Faral and Kwahu took outside and released.